N.Y. 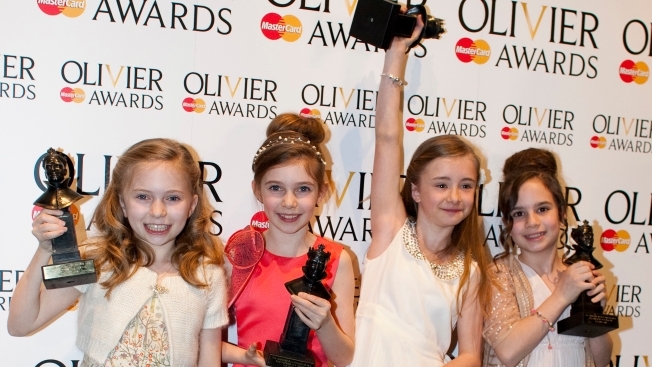 Casting Call for Broadway's "Matilda"
Four girls shared the title role, and the accolades, in the West End production of “Matilda.” From left, Sophia Kiely, Eleanor Worthington-Cox, Kerry Ingram and Cleo Demetriou. Producers of “Matilda,” the musical based on the popular children’s story by Roald Dahl, will hold an open casting call for the title role on Sept. 30 in New York. It's slated to begin previews on March 4 at Broadway’s Shubert Theatre, ahead of an April 11 opening. From a practical standpoint, the actress “should be a strong singer and confident speaker, with a good understanding of text and intelligent approach to acting.” “Matilda is a fiercely clever child; living in an abusive household, she escapes into books and her imagination,” they note. No prior experience is necessary, and only the title role will be cast during this audition process. Hopefuls should bring sheet music for a short song; there will be a piano accompanist in the room. Actresses also are asked to “prepare a short story or poem in the style of Roald Dahl,” committed to memory. The casting call is at Pearl Studios, 519 Eighth Ave., between 35th and 36th streets. Check-in begins at 10 a.m. Interested parties can call 212-719-9393, ext. 360 for more information. Dahl is the author of a slew of children’s favorites, including “Charlie and the Chocolate Factory” and “James and the Giant Peach.” The musical will be directed by Tony-winner Matthew Warchus (“God of Carnage”). It’s produced by the Royal Shakespeare Company and The Dodgers. Tickets for "Matilda" go on sale to the general public on Oct. 1 at 9 a.m. via Telecharge.com. Both American Express and Google are offering pre-sales, according to Playbill.com. The official Broadway trailer is below.